The Intel® Scalable Platform (Purley) features a new server microarchitecture that supports the next generation of DDR4 server memory. The Purley platform significantly increases memory bandwidth performance by incorporating an additional two memory channels over the previous quad-channel Grantley platform. With a total of six memory channels available to the processor, and an increase in memory speed, memory-bound applications will experience a dramatic boost in performance. 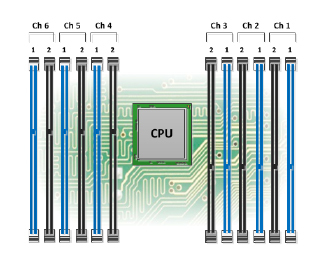 Memory architecture is based on Six Channels arranged in Two Banks per processor. Each processor can be configured with 6 or 12 modules, depending on the motherboard layout, to achieve the maximum aggregated memory bandwidth. *Xeon Platinum 8180, 8176, 8170, 8160 or Gold 6142, 6140, 6134 required to achieve 1.5TB per processor. All other Xeon models limited to 768GB per processor. Supported memory types and operating speeds will vary by server platforms and processor model used. Memory types (Registered DIMMs, Load Reduced DIMMs) cannot be mixed within the same server.